As I noted when we introduced our new fee calculators, eBay's fee structure has gotten quite complex, and today, the company is announcing a move to simplify its fee structure - but while there are more opportunities to list with no insertion fees, this should not be seen as an overall decrease in fees. eBay is announcing its 2013 Spring Seller Release today in which it will offer more free listings and will eliminate its category-based, tiered commission fee structure for non-store owners in favor of a flat across-the board commission. Sellers without a Store subscription will receive up to 50 free listings per month - either fixed price or auction - and will be charged 10% final value rate across all categories. For items up to $50, this is good news in many categories for fixed-price listings except for electronics, which had a FVF of 7% for items up to $50. Books that sold for under $50 currently incur a FVF of 13%, for example. But because there's no tranched FVF structure, this will be a fee increase for high-value items. For example, Clothing Shoes and Accessories currently have a FVF commission of 10% of the total amount of the sale for up to $50, but after that, the FVF drops to 8% of the remaining balance up to $1,000, and drops to 2% of the remaining balance over $1000. Under the new fees, it will be a straight 10% FVF. For Auctions, non-Store owners paid 9% FVFs across the board (no tranches), and this is increasing to 10%. 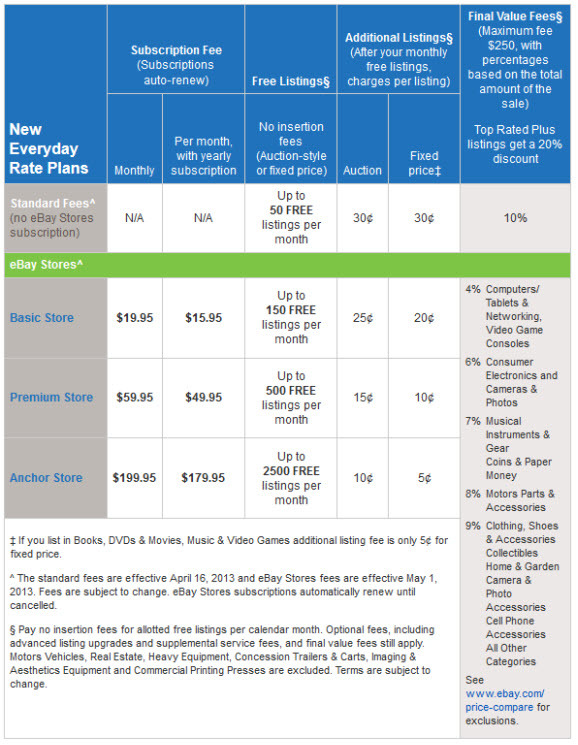 eBay is also changing fees for Stores and is making a great number of other changes. See today's Newsflash story for more information about changes to feedback, eBay's attempt to reduce deadbeat buyers, and other news. - eBay will require Buy It Now prices to be 30% over the starting price for auction BIN listings. - Beginning May 1, positive, negative, or neutral buyer feedback will be removed from transactions in which an eBay Buyer Protection case is resolved in the seller's favor by eBay, including comments and DSRs. - Beginning in May, eligible fixed price listings and auction-style listings purchased with Buy It Now will remain for sale until a buyer has paid for the item. Be sure and read Tuesday's news story for more details, and let us know what you think of these changes and which ones will impact you the most. Interesting. If you a site owner of an "Alternative" site with monthly membership fees be ready to face eBay new move. Listing fees for stores for fixed price are doubling. "Starting May 1, get up to 2,500 FREE listings* per month with your eBay Stores subscription." You have to have an anchor store to get the 2500 free listings. Premium store gets 500 and basic 150. After that, the insertion fee is double what it is today. This won't change a thing. selling nothing at today's fees will cost the same after the new structure in fees starts..............''Selling nothing ends with same results''............ ebay is just FLAT DEAD ZILCH NADA is selling. Although a lot of sellers will like the item still for sale until payment is made, for many of us it will be a nightmare. I sell books. I change all the books in my store every month, so it can take quite awhile to go through all my books each month, plus I offer reduced shipping on multiple purchases. I have buyers in Australia who may take a week or more to pick out their books as they're putting together enough to fill a Flat Rate Legal Envelope. I'm sure there are sellers of other items where their buyers will buy something and then take their time going through other items to find more things to purchase. I hope you can opt out of this option. How does one go from monthly to yearly subscription for an ebay store? It says the insertion fee for a fixed price basic store item is 20 cents. Where does the doubling happen? No mention of 40 cent fees. In regard to buyer feedback, it is a tiny good thing, to have feedback removed in a seller-favored case. But what about this scenario: Buyer makes purchase. 30 minutes later, changes mind and asks for a refund. Give the refund. Buyer leaves negative. This all happens within the timeframe of 2 hours, as an example. The buyer should NOT be able to do so. Am I reading this right that there will no longer be tiered insertion fees for auctions? I have a premium store, which gives me the 15 cents auction listing fee (after my free 500 listings). That 15 cents will be the fee no matter at what price I start my auction? Thanks! So Basic stores receive only 150 free listings/month. After that, a Basic Store owner will continue to pay 20 cents for Fixed Price insertion fees, but insertion fees for Auction listings will go from 10 cents to 25 cents. So once again they have not honored their promise to make buyers contact sellers before opening a complaint I see. If they continue to chip at the foundation of their business sooner or later it will collapse taking us, the sellers with them. The new fee structure will result in sellers reducing listings. It will for me. Many of my items sell less frequently than others. They will not be available to ebay buyers after the listing fee doubles. I will strive to reduce my listings from the current 800+/_ to as close as possible to the 500 magic number for my store level. Step by step ebay is helping me move toward retirement. From what I can tell, I'm seeing an additional $10 in store fees per month offset by 500 free listings per month on a regular basis. Then after that 500 cap, the formerly 5 cent listings double to 10 cents. I don't use auction format very often, but that format listings are going from 25 cents to 15 cents? I may have missed it, but is that a static fee for any starting price? The majority of my items sell for under $50, so the across the board FVF should be the same for me. The biggest thing that will affect me, that I see so far is ''fixed price'' & ''buy it now'' staying for sale until paid for. This may affect my multiple purchase people. If they shop over the course of a couple days and then request an invoice with a shipping discount - they could lose an item or 2 while waiting. OR, if I'm out and they request a combined invoice but I don't see the request for a couple hours, they may be mad if they lose an item. Is the ''combined'' invoice feature going away? It would seem to me that multiple sales are good for eBay, too. Some buyers do understand that the discount algorithm is figured into the invoice, but too many are still confused by eBay's wording after a sale and either pay individually for each item, necessitating a partial refund, or wait for an invoice, which now will apparently be risky for them. A clearer path is needed for buyers at check-out in multiple purchase scenarios. This would definitely affect those few who still pay by money order and ill-advised cash. I get a request for this every so often. Can't wait to read the ''rest of the story'' on the changes. It would be helpful to hear how the fees are going to be higher or lower for you - it will be different depending on what you sell, if you have a Store, your preferred listing format (auction or fixed price) and the average selling price. @basset thanks for details! I see a number of people aren't happy about the Buy It Now change, I can see where that could present problems. I was on the verge of going to the anchor store (under the old structure, the breakeven was 12,500 items in the store). Now I definitely will...and my costs should be about the same when all is said and done (and actually I think I will save a few bucks as the book FVF is lower). Should put about 50 bucks a month more in my pocket (well, 35 after I pay Uncle Sam and Uncle Andy their cuts). Cha-ching. It seems to me that ebay's "comparison" isn't a true comparison. A true comparison would show the rates for everyone BEFORE any TRS discounts and it would include PayPal fees. I still don't trust them.